You may know the story of the crow and the pitcher… but in this study the crows are carrying cigarette butts instead of pebbles! Through this article, we’ll revisit this ancient fable with a modern twist. In previous newsletters, we’ve had a chance to highlight the crow’s intelligence, particularly its ability to plan ahead. But believe it or not, since August 13, 2018, six of these birds have been collecting cigarette butts and other trash at the Puy de Fou amusement park in France. How is this possible? Former research on crows has shown that they are capable of making and using tools to obtain food. They are also capable of holding a grudge and can remember when a human deceives them (again over a food reward!). In some areas, they even possess certain cognitive capacities as complex as those of the great apes. Christophe Gaborit is in charge of the raptor training school at the Puy du Fou park. Since the early 2000s, he has been training rooks (corvus frugilegus) to collect garbage. 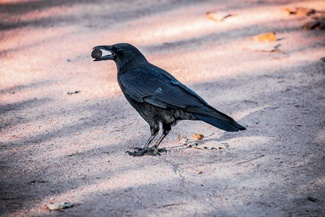 This is how it works: the corvid first deposits a piece of trash in a kind of double drawer and, as a reward, he receives some seeds. Repeating this conditioned learning bore fruit and the crows (two for this first training session) were able to make the association between cleaning up and a food reward. The master falconer notes however that the birds are sometimes prone to mischief: deceiving him with pieces of wood. Seeing the success of this first training session, C. Gaborit continued with a brigade of 6 crows who quickly (within a few weeks) learned how the “magic” drawer worked. That’s why since the summer of 2018, visitors can catch a glimpse of the crow ballet in the park’s parking lot. But, as the falconer says, this in no excuse for people to litter the park. This French initiative is based on a process described in 2008 during a Ted Conference by Joshua Klein. The young Californian presented his experimental crow vending machine that offered crows a reward in exchange for pieces of garbage. A Dutch start-up (Crowded Cities) even specializes in using the method for picking up cigarette butts along roadways. Let’s hope that these birds that are now being used to undo human carelessness will soon be out of work. Source: “Crows trained to pick up litter at French theme park”, article by Colin Dury, posted in the Independent on August 11, 2018.